Our research continues to argue that the current, record rebound in gold stocks will continue. Every time we’ve predicted a correction, the weakness in the sector has been only a fraction of what we expected in both price and time. New bull markets that follow epic bear markets typically show exceptional strength in their first year. This bull has been no different. Thus, we expect the strong performance to continue. Today, we share a few reasons why the junior sector is poised to outperform in nominal and real terms. The junior sector should see an increased benefit if $1300-$1400 Gold becomes a floor and Gold continues to rise. 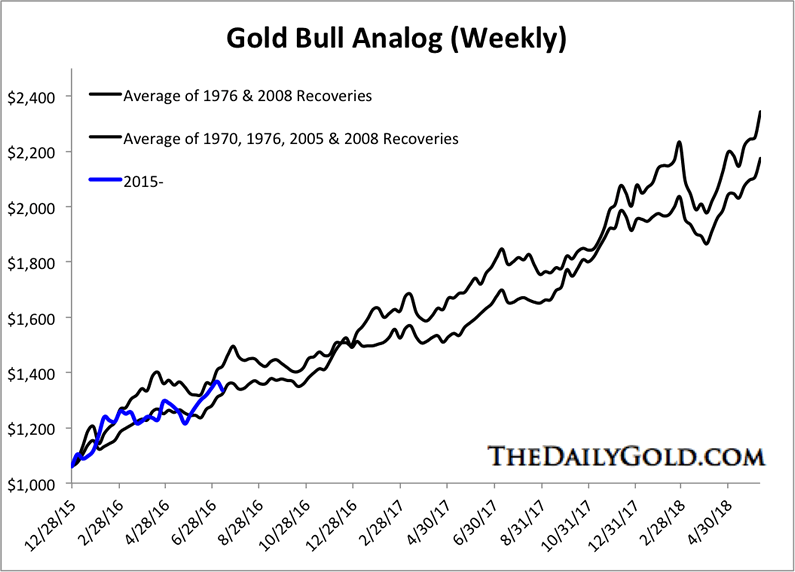 The weekly Gold bull analog below shows that Gold’s recovery has been following the weaker of the two analogs. If that continues, Gold could retest its all time high by the end of next year! Be advised that no one can predict the future and these are projections based on a limited history. That being said, we believe the fundamentals for the junior sector have never been better and there is a strong precedent for the sector to go gangbusters in the years ahead. We did not even mention the full blown mania of the late 1970s and the mini-mania that occurred from 1993 to 1996. 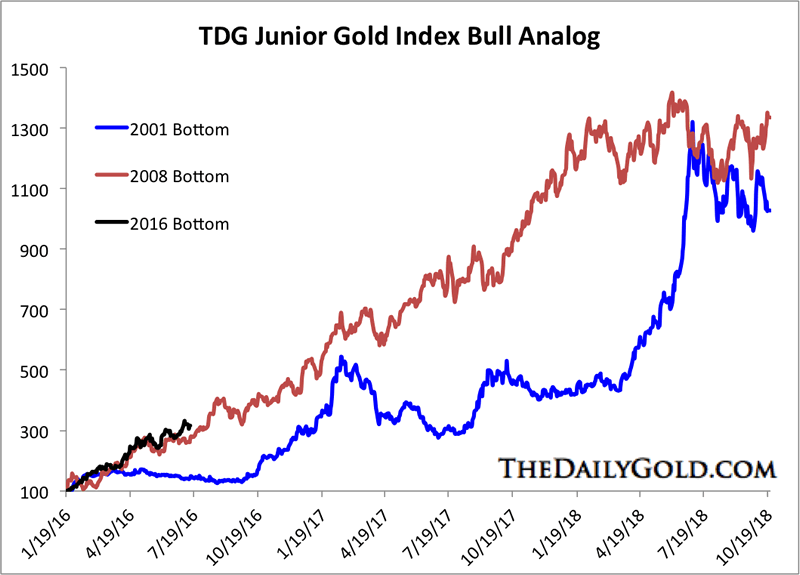 In short, we believe the precious metals sector continues to offer upside potential but that the junior space both in real and nominal terms offers the best risk/reward potential. Consider learning more about our premium service including our favorite junior miners which we expect to outperform in 2016.